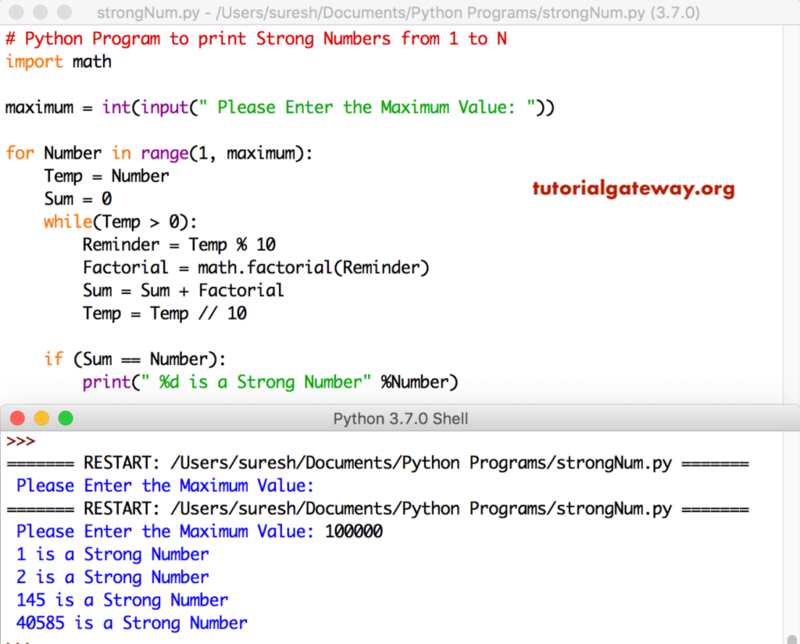 In this article, we will show you, How to write a Python Program to print Strong numbers from 1 to 100, or 1 to n, or minimum to maximum with example. TIP: I suggest you to refer Factorial, and Strong Number articles to understand the logic. This python program allows the user to enter the maximum limit value. Next, this program will print strong numbers from 1 to user entered value. We used While Loop to split the given number. So that we can find the factorial of each Digit in a Number. Within the While loop we used factorial function to find the factorial. If statement is to check whether a given number is Strong Number or Not by comparing original value with sum of factorials.